Please write here feedbacks for improvements script. after admin will add Rage Core, it not works without . It impossible if you cast SS because of so long combo and blast will come too late. when is rage core out? is it necessary for all your rage scripts ? I tried to play a game and Invoker wasn't auto-attacking. How are we supposed to have combo key set up now? Ensage.SDK orbwalker, the orbwalker in Voker Rage and now Rage Core all have "orbwalking", I was of the understanding the walker in Voker Rage was used in conjunction/piggy-backed off/with the SDK orb walker and before the update it wasn't an issue, it was working fine. With the introduction of Rage Core, auto-attacking doesn't work - its' similar to the stutter with the harass option in Last Hit Rage. I tried disabling the SDK walker and use the combo key in Voker Rage, which is set as the same key as orbwalk in Rage Core, to no avail. 3 walking options, 1 key - which/how do we use? Something wrong with Compiler. Invoker still load old version. i investigate with this problem. No. Auto Combo now merged with Dynamic. Currently Dynamic combo more smart and you still have option to wait allay stun. Plus we have custom combo selection for it. @SirLimon - any news on the update 41? Guys Wait There Problems with Rage Core, so Scripts what based on Rage Core will not work. This is not SirLimon fault , it's compiler can't update scripts. So for now we wait for Admins, what will fix this problem. Good script very easy to use! what is the combo key? Rage Core won't use Bloodthorn in combos (didn't use Orchid either) - I haven't tried any other items but I'd say it would be the same. Meteor isn't very accurate and misses a lot (seems it casts earlier than it did before and looks like that's what is making it miss). Some spells in the custom combo are skipped (say Tornado and Cold Snap are invoked prior to engaging the combo, with Meteor to follow as the third skill, it will skip the Tornado, which would be used after Cold Snap). I do like how the Dynamic Combo is faster, which means it uses more spells - though sometimes it won't cast a spell, resulting in the Orbwalker chasing down and attempting to Auto-Attack the target (say you throw a Tornado, it'll cast Alacrity and attack the target while following, it sometimes will invoke Cold Snap, but won't cast it and instead will chase down the target resulting in a missed kill). I have also found the Dynamic Combo will ignore already invoked spell's (for example, Cold Snap & EMP), but then will invoke X, Y & Z and use them instead. Dynamic Combo will only stick with paired skills when you're still under level 16/18 (if I remember correctly), with or without Aghs. Previously you could set the "Max Level" to whatever and it'd show a 4 spell combo as the upcoming dynamic combo (I'm pretty sure it was set at level 12 in the previous version). I feel like there is something I've forgotten to mention here - when I remember I'll add it. Problem with meteor also not found. What combo cause this problem? I coulndt use LAST HIT KEY from Rage core settings ( if its for farming-last hit for creeps) ... No move after i use the key, so i kept using ensage orbwalk farm. As a result, even for a guy who is trash as invoker, its a script makes you a good invoker player. I guess it deserves every penny you paid. After my trial is over, i will definetly buy this one . I think you use manyal mode, so script doesnt use EUL auto. Can you make it to switch to WWW during escape mode (does this for fast ghost walk but not escape mode). Also when someone uses dust during escape mode while in ghost walk it will not recognize this and will not cast icewall or tornado. Custom combos should be able to put in the same spell more than once for refresher combos. Would be cool if we could put items in the order you’d like them used in custom combos (scythe, rod, euls etc). Great script. Ok, will update escape mode. For Custom Combo you should place refresher after 2x spells and its spells will be used twice. Or you need more spells? Items will add in next update. Icons are busted after the latest Dota update. You can't sus out which spells are which as it invokes more than 1 spell, with a 1 spell custom combo selected. I am having trouble using this script i have installed rage script too but what is the key to use the combo and where can i find it and change it please help! there is a orbwalk mode and last hit mode anything i am missing? Make sure 09K.AIO is not loaded and SDK orbwalker is not loaded. Just use rage core orb walker. Here you can see the combo has been selected and prepared (TN>CM>CS) anddddd when the combo key is pressed, it invokes and uses alacrity and auto attacks. Are you supposed to manually initiate with the Tornado? We'll try this again, same combo, same sort of result, invoked Alacrity and a thrown Chaos Meteor - no Tornado. About escape will check it. Will do, thanks for sussin' it out for me - it was driving me crazy. got some problems with the script. Its casting always ghost walk and ice wall. I dont klick anything doing by its own. And the combo buttom is spacbar? Don't think ally start mode is working with black hole. I just keep right clicking without casting any spells. 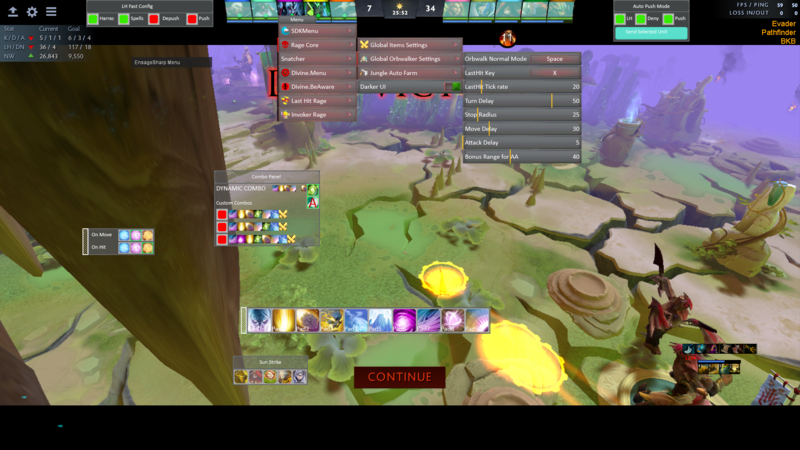 Tested it with a few heroes/items (Magnus, Sven, Atos) and it worked correctly. Also, when I use the escape key I go into ghost walk with quas orbs but after a few seconds my hero casts wex orbs and breaks the invis. Maybe some bug in SDK. Will chekc it. Will fix auto cast for Enigma ult. thanks for the response hope you were able to fix the non casting issue ..
hi can you be a little more specific as in how? do you mean to enable the eules option below the refresher icon ?? ?